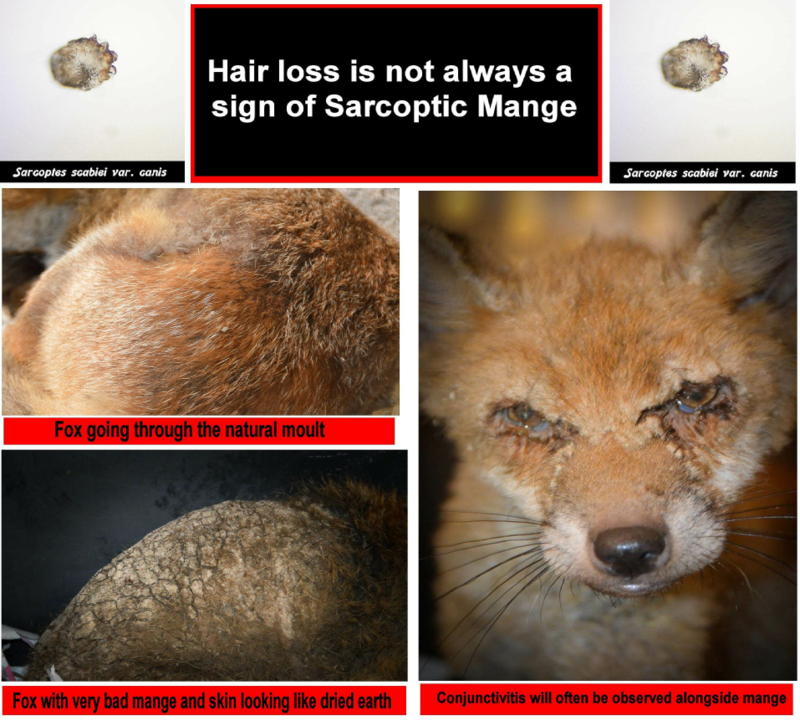 Sarcoptic mange, fox mange, dog mange, mange, Sarcoptic, homoeopathic, Arsenicum, homoepathic, fox, foxes, sarcoptic, mange, sarcoptic mange, mite, ivomec, sarcoptes, scabei, arsenicum, arnica, fox cub, cub, homoeopathic, homeopathic, sarcoptic, cubs, orphaned cubs, vixen, mangy fox, mangy, vulpes, vulpes vulpes, red fox, animal fox, kitsune, zorro, abandoned fox cub, sick fox, canine mange, mangy, mangey, fox rescue, uk fox rescue, mange treatment, fox treatment, injured, sick mange, dog mange, fox mange, mange mite, mange, sarcoptic mange, dog mange, fox mange, animal mange, sarcoptic mange. What causes fox mange? : Firstly there is no such thing as fox mange, many mammals can get mange, not just foxes. The correct term is Sarcoptic Mange or Canine Mange. The mite responsible is called Sarcoptes Scabiei. How can I tell the difference between a fox with mange or a fox moulting? When a fox moults, its new coat is underneath, so there will be no bald patches. With mange, it goes down to the skin. Where does Mange normally start on a fox? Mange can start anywhere on the foxes body but It tends to start at the back end and work its way to the head. The fox will scratch and bite and hence can transfer it to the head region sooner. Can my dog catch mange? Yes, although only a slight risk, it is there nonetheless. It is however very easily treated in domestic dogs and may be worth mentioning to the vets if your dog starts to constantly bite at its paws, legs or underbelly. If you use Advocate on your dog /s once a month available from vets, this should ensure they stay mange free. 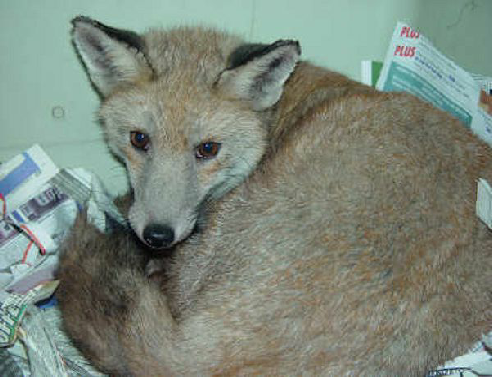 Why do you send out an homeopathic Free Treatment for mange in foxes when there is conventional treatment available? We send out the homeopathic treatment because it’s safe and effective. We have been sending out this treatment for over 25 years with brilliant results. We are not homeopaths and we do use conventional medicine when we have hands on with a fox. The conventional mange treatment Ivermectin, can be very dangerous for many reasons. The first being that if a dog with any collie line in it, was to take food meant for the fox that was laced with Ivermectin it could kill the dog. Since the life cycle of the mite is three weeks, Ivermectin is best given once a week for three weeks. If you were to miss a dose, it wouldn’t be effective. Also to try to target just one fox, when you are likely to have more than one visiting is very hit and miss. We have also found that for a fox with advanced mange, this could prove to be the kill rather than the cure. When one thinks how many mites are living and breeding on the host and one injection kills them all, the toxins from all these dead mites can overload an already overstretched immune system. We feel that a fox with advanced mange should be brought in and stabilised with re-hydration fluids and antibiotics before conventional mange treatment starts. Furthermore, if people were treating foxes with Ivermectin and we were to be called out to the same fox, we wouldn’t be aware of how many doses the fox had, so could overdose. Many think of homeopathic treatments as the placebo effect, but since foxes are not aware they are being treated with alternative medicine, the placebo effect can’t work. We send it our free of charge, why would we, if we didn’t think it was effective? What other symptoms apart from hair loss should we look out for with fox mange? Possibly the main one is the constant scratching and biting. Some other symptoms can include the following; One leg off the ground due to soreness of the mange ( usually a back leg). Out during the day when you wouldn’t normally see a fox. Fox walking around like its got lead boots on its feet. Apparent disregard for humans, ie doesn’t run away and shows no real fear. Sleeping in your old rabbit hutch, barn or shed and only looks up and doesn’t run when you approach. Conjunctivitis ie eyes gummed up or looking like slits. Wounds either side of the tail, where we believe the fox may drag its rump across the ground to relieve the intense irritation. A great thirst, when usually you would be lucky to see a fox drink for a few seconds, a mangy fox can drink for minutes. (This is never a good sign so you should call us 07778 183954). In advanced stages a fox with bad mange can look like its skin is actually dry cracked earth. A fox with bad mange will be emaciated, and its whole posture will look wrong. They actually take on a hunched look leading some to believe its a wallaby or a strange creature. Can I catch Scabies Fox Mange from an infected fox or dog? There is a small chance you can get a reaction from mange. This reaction causes small pimples that prove more irritating when hot, ie after a bath. This is usually self limiting in that once the animal is treated that passed on the reaction, your symptoms go. A course of antihistamine's usually stops the irritation. 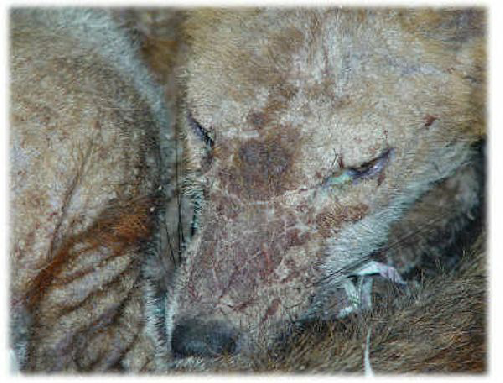 The mite that causes mange in foxes is not the same mite that causes Scabies. The mite that causes scabies is known as Sarcoptes Scabiei hominis and there are over 100 different species of mites and most are host specific. Along with conventional mange treatment Ivermectin, we have found the 2-week antibiotic injection given by our vets (Covenia) to be really effective. The video above gives some facts about Sarcoptic Mange and also shows how quickly the mange mites can move and what they look like alive and under the microscope using different magnifications.